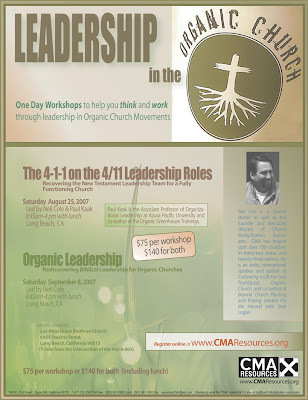 Neil Cole, executive director of Church Multiplication Associates, author of Organic Church, and pastor of Awakening Chapel, a Grace Brethren church in Signal Hill, Calif., will be leading two workshops in Long Beach, CA in the coming weeks. Thanks for the plug. We had these workshops in Ohio and they are dynamite!!! Something folks in our family of churches should know about and take advantage of!! !